What does a Bruges Waffles & Frites Franchise Cost? The Bruges concept is based on the European approach to food—indulgent, flavorful and to be enjoyed with friends and family. We believe food should be savored not just eaten. This carries over to our approach to franchising. A Bruges Waffles & Frites owner/operator doesn’t just own a business; he or she becomes part of something bigger—the Bruges family. Our collaborative approach to franchising means everyone works together to build something better and to share in mutual success. Bruges Waffles & Frites offers a delicious, unique menu you won’t find anywhere else. With authentic Liège waffles, genuine Belgian frites (the best and original french fry), gourmet omelets and waffle sandwiches, and—of course—the famous Machine Gun Sandwich®, Bruges creates an authentic Belgian culinary experience right in your neighborhood. 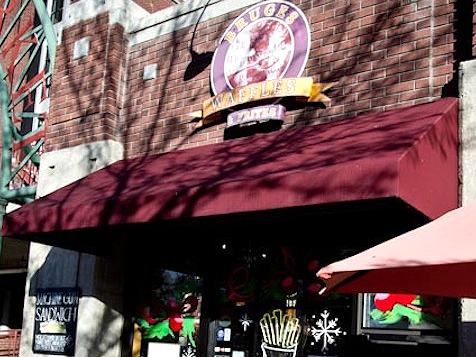 Open Bruges Waffles & Frites in any of these available states: AZ, CO, ID, NV, OR, WA. 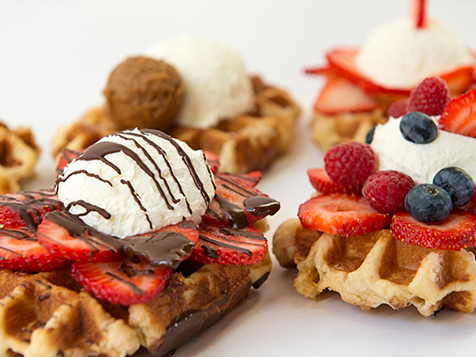 Bring a bit of Europe to your neighborhood with a Bruges Waffles & Frites franchise! Our unique menu and all day appeal—breakfast, lunch, dinner or dessert—makes Bruges Waffles & Frites one of the hottest new fast-casual brands to enter the restaurant market. Don’t just take our word for it, search for us on Google or Yelp! to read customer reviews for yourself! The Bruges concept was born in 2003 when Belgian natives Pierre Vandamme and Philippe Wyffels met in Salt Lake City and lamented how difficult it had become to find the authentic Belgian flavors they had enjoyed growing up. Starting with family recipes and their memories, they worked in diligently in the kitchen until they had perfectly recreated the Liège waffle of their youth. When they shared their rediscovery at the local farmer’s market, it was an instant success. They soon expanded operations to include genuine Belgian frites and other Belgian specialties served at multiple restaurant locations. Today, food lovers from all over the world have enjoyed Bruges’ famous waffles and frites! Now available as a franchise opportunity, Bruges is seeking owner-operators to help us share the Belgian experience throughout the American West. Is Bruges Right for You? Can you help us create the Bruges experience in your community? Are you friendly, fun, and cultured (but not pretentious!)? Will your customers feel like they have experienced a little bit of Europe when they visit your restaurant? Do you love quality, made-to-order food and wonderful service? Then we are looking for you! Bruges owner-operators are energetic and comfortable in a fast-paced environment. We want people who are active in their community, and have strong communication skills and natural leadership ability. No restaurant experience is required, but you must be financially sound with a clean background. Bienvenue! Welkom! Join our family! Bruges Waffles & Frites is currently offering territories in the following states: Arizona, Colorado, Idaho, Nevada, Oregon, and Washington. Want to learn more? Complete the form below, and you will be contacted by a Bruges representative.